The Crystal Palace is on Fire! by Alison Edwards and Keith Wyncoll. 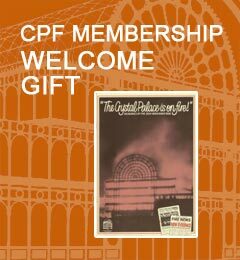 The Crystal Palace was destroyed in November 1936 in the biggest peactime conflagration London had ever known. "The Crystal Palace is on Fire!" was the frantic cry that brought thousands of people on to the streets on that fateful night. This "Palace of the People", constructed of iron and glass, had been London's centre for 'enlightenment and entertainment' for four generations. Its demise was, for many, like the passing of an old friend. To tell this fascinating tale, the editors used interviews from firemen, police, Palace staff and those who witnessed the spectacle from near and far. Their memories form the core of this splendidly illustrated work which is the most in-depth study of the fire and it background ever published. Was it an accident, or was it arson? Alison Edwards and Keith Wyncoll share with you the theorieswhich abounded at the time and are still the subject of many a debate today. These, together with previously unpublished official records, are examined in an attempt to solve the mystery of the Crystal Palace fire.